Life experience counts for a lot in this world. You’re self-assured, you know what you’re doing, and you know that life is there to be lived. We find the same attitudes with our older pups who become part of the Homes for Huskies family. Miklo is a handsome older statesman at nine years young. He still runs like a pup and still has many happy, healthy years to give his humans in his new furever home, and can’t wait to meet you! With lovely blue eyes and a grey wolf coat, he’s got Paul Newman-esque good looks and a smiling, happy attitude to life to go along with the handsome. Miklo loves to play and has plenty of energy, although in his wisdom, he tends to save it up for when his people return home. Then he’s all about chasing his ball around the yard. This smart gent is also open to a treat or two and will happily perform a wide repertoire of tricks (with the right treat-based payment, of course). He knows sit, drop, shake and stay, and is living proof that you can teach an older doggo new tricks. Miklo is a quiet man except for playtime chatting, and he’s quite happy to tell you if he hasn’t had enough pats. He loves all people, young and old, and when playtime is over there’s nothing he loves more than curling up on the couch with you until it’s bedtime. Miklo isn’t a huge fan of other dogs, we believe from lack of socialisation all these years, so he would be best suited to a home as an only dog and no off leash park visits. Miklo has arthritis, he is receiving Laser Treatment at our vets weekly and is responding really well and is pain free. He will receive another two treatments and be assessed for future treatment for him from there. His daily walks have also helped build his muscle wastage and this has given him a new lease on life. If you think you need the George Clooney or Robert Redford of the husky world in your life, please fill out an application form! 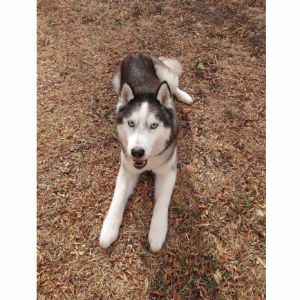 We have a new member of the Homes for Huskies family who is looking for a furever home. Leila has brought her supermodel good looks, playful zest for life and chatty demeanour to the party. 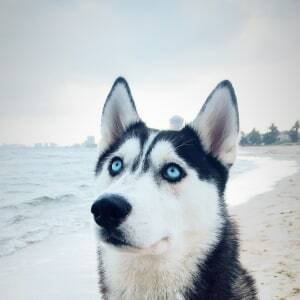 She’s a happy and healthy girl with a black and white coat and lovely blue eyes. Leila needs a new home as apartment living hasn’t been ideal for her, and her people are hoping she’ll have a better quality of life with a yard. Leila loves to play and often will drop toys in people’s laps for a play and loves to play fetch at the park. She will play with dogs of a similar size but has total disdain for smaller dogs (she’s got a dominant personality and small dogs just aren’t on her radar). Leila has lived as an only dog, but would be happy to have a companion that isn’t dominant. When it comes to people, Leila is friendly and affectionate and loves scritches, belly rubs, attention and exercise. Leila has also been well trained and is good on lead, but does get very excited on walks so she’d love more leash training. This might be a result of her being an apartment-dweller so this could change in a new environment. 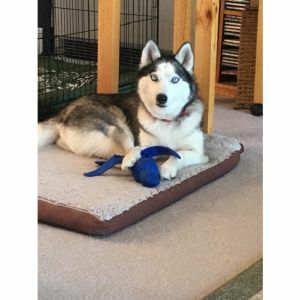 Leila is a very quiet dog who doesn’t often bark or howl, but LOVES a husky chat, especially during play. She’s very happy to argue and ‘talk’ with her people, and has lots of personality and love to give. We know she’ll thrive in a home with a yard and she can say farewell to apartment living. She’s untested with fences and digging, as it’s never been an option for her, so we need her to go to a home with 6ft husky-proof fencing to be safe. No cats or pocket pets. She's been vaccinated and desexed and her health is in impeccable condition. * Meets and greets will be essential with any current dogs. Leila is just lovely and truly deserves a home where she will be provided with a lot of love as she really has so much love to give. This delightful little darling Sharney is ready for adoption now. “Little” being the operative word, she is tiny and gorgeous like a mini-husky or a puppy who stopped growing. She looks and acts like a puppy; and it’s hard to believe she’s 10 1/2 years old. Even though she has had a very sad background she has quickly learned to live the good life. She is stunning to look at and now loves her food, so consequently has gained wonderful condition and is very sleek now, able to run 10k no problem. Her foster carer reports - Having had this precious wee pet in my care now for at least 8 weeks, and with her significant increase in condition (she’s eating really well now and liking more varied food), she has turned into a veritable pocket rocket and just wants to go and seek adventure. The jogs and walks we have twice a day are the highlights of her life. She will certainly need an energetic human to take her on daily outings. Sharney could be an only dog or she’d love a playful tolerant younger dog. Sharny is learning how to “play husky” with great success. Very young children may be too unpredictable for her, but mid-upper primary children and older are fine, though she needs a gentle environment. She also demonstrated really good doggy socialising at the beach recently. Sharney has been fully vetworked and fully health checked with no health coverage concerns.